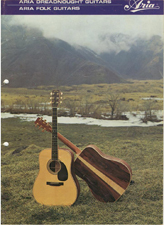 There are at least a couple of Aria Guitar Catalogues in the early 70s that were co-branded with R. Matsuoka on some pages. 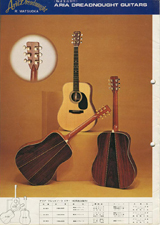 The first 3 pages of the 1973 catalogue (Cover and page 2 shown below) we're Aria/Matsuoka branded dreadnoughts. (The D25, D30, D35, D40, D50, D60 and D80). The model names matched the prices listed on the grid in the catalogue in Yen. So the D25 was 25,000 Yen up to 80,000 Yen for the D80. I believe the guitar pictured below is the the same specs as the D80 pictured on the front of the Aria catalogue below. Though it is not branded Aria it has a typical Ryoji Matsuoka label inside the sound hole with Model '80' on the label. The wood used on the back, sides and headstock of the guitar is as stunning as any i've seen on a guitar. All woods used on the guitar seem to be solid. The grain clearly visible on the edge of the soundhole on the top and the swirling grain patterns on the back and sides closely matching inside and out. The neckblock is not stamped with a date/production number which seems to be true of all matsuoka guitars i've seen before 1974. 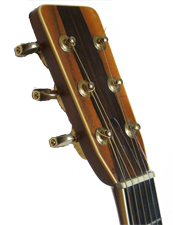 I have only seen one guitar similar to the one pictured above, but this had an elaborate abalone inlay R.Y.Matsuoka on the headstock in the style often seen on a Martin guitar..
More details to follow in future.